I like their uncompromised winemaking approach and I like their understated marketing. No flashy Moët-esque packaging either, just class. 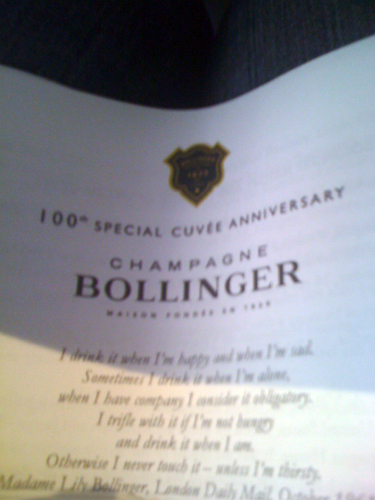 In fact, the only impediment to me ‘loving’ Bollinger is that the NV (Special Cuvée) has been a slightly variable beast at times, largely due to some very questionable parallel imports that popped up recently (which were in very poor condition. Caveat emptor for anyone buying a bottle not wearing the official ‘imported by Fine Wine Partners’ back label) and made buying Bollinger outside of a bottleshop something of a lottery. I believe that the parallel supply has dried up now though and, as you can see below, the ‘official’ stock is tip-top stuff. 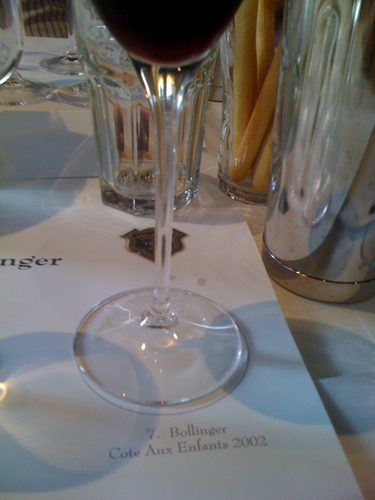 The following Bollinger wines then were tasted at a fabulous sit down masterclass earlier in the year, put on to celebrate 100 years since the naming of the Bollinger Special Cuvée. Not a bad milestone that one…. Notes from the winery are in italics. Based on Pinot Noir (60% Pinot Noir, 25% Chardonnay, 15% Pinot Meunier) with approximately 80% of the grapes sourced from premier or grand cru vineyards. It spends three years on lees with 20-35% fermented in barrel, the rest in stainless steel. 5-10% reserve wine (from magnum) is included in the blend, with the reserve wines up to 15yrs old. The only still wine in the Bollinger range, this has been made for for 100 years+. Produced from a single, south facing 1 hectare grand cru vineyard near the heart of Aÿ. Fermented cold for 10-12 days and then aged in 3-5yr old 205 litre oak barrels for 2yrs. A portion of this is blended with the Grande Année white to produce the Grande Année Rosé. Picked at 12 baume, with 7g/l acidity. Interestingly, it’s still cropped at 8 tonnes hectare, which is fine for Champagne but would make Burgundians weep (with envy. A $220 wine cropped at 8 tonnes a hectare? Wow). Just 4,300 bottles produced. 62% Pinot Noir, 24% Chardonnay, 14% Pinot Meunier. 85% premier and grand cru fruit with 5% still Pinot Noir from Cote d’Ay and Verzenay. 8.5g/L dosage. Served from magnum. 16 Crus used in this blend, 76% grand, 24% premier cru. 63% Pinot Noir, 37% Chardonnay. 100% barrel fermentation. 7-9g/L dosage. Tricky year this one according to Bollinger winemaker Stephen Leroux, with 20% of Champagne lost to botrytis. Incidentally he also mentioned that 2001 was an ‘ordinary’ Champagne year and that up to 35% of the 2010 crop was lost to Botrytis. 17 villages used with 82% grand, 18% premier cru vineyards. 65% Pinot Noir, 35% Chardonnay. 100% barrel ferment. Cellared in magnum under natural cork. 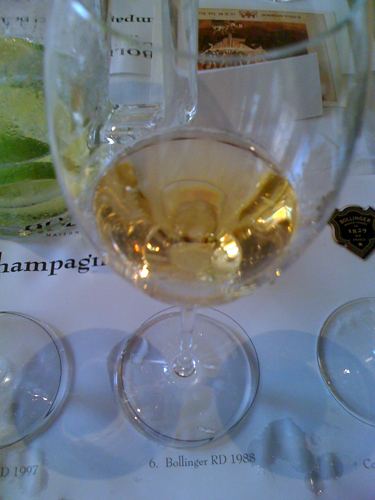 A blend of Grande Année sparkling with 7-8% La Côte aux Enfants still wine. 7-9g/L dosage. This vintage is apparently comparable with 1970 and 1983. Essentially the 1997 La Grande Année held back on its lees (in magnum) for at least 8 years, whilst this particular bottle was disgorged in July 2010. 3-4g/L dosage. 1997 was an inclement vintage that eventually ended dry and hot. Served from magnum. Bollinger R.D. 1988 (Champagne, France) RRP $? 17 crus with 66% grand and 34% premier cru vineyards. 72% Pinot Noir, 28% Chardonnay. pH 2.97. Disgorged circa 1998 and has spent the last 13yrs in the cellar of Paul Boothy of Fine Wine Partners. Served from magnum.